Line 5 Eglinton, also known as the Eglinton Crosstown Line or the Crosstown, is a light rail line that is under construction in Toronto, Ontario, Canada. Owned by Metrolinx and operated by the Toronto Transit Commission (TTC), the line will be part of the Toronto subway system as its fifth route. The first constructed phase of line will run entirely along Eglinton Avenue for 19 km (12 mi) from the future Mount Dennis station underground to Sunnybrook Park, after which it will run predominantly at-grade along the street's median to Kennedy station, where it will connect underground with Line 2 Bloor–Danforth and Line 3 Scarborough. The line was conceived in 2007 by then-Toronto mayor David Miller and then-chair of the TTC Adam Giambrone as part of Transit City, a large-scale transit expansion plan. The first phase of the line will include 25 stops and is expected to be completed in 2021. Additional future extensions to the line in both directions, with proposed termini at Toronto Pearson International Airport in the west and the University of Toronto Scarborough in the east, were approved by Toronto City Council on March 31, 2016. Line 5 Eglinton was originally conceived as the Eglinton Crosstown LRT, a partially underground light rail line, announced in 2007 by Toronto Mayor David Miller and TTC chair Adam Giambrone. It was part of the Transit City plan, which included the implementation of six other light rail lines across Toronto. The original version of the line would have run from Pearson Airport along Silver Dart Drive to Convair Drive. The line would have then turned southwest to a bridge over Highway 401 to reach Commerce Boulevard on the other side, where it would run south to reach Eglinton Avenue and the east end of the Mississauga Transitway. The rest of the line would run east along Eglinton Avenue, including a portion along which the proposed Eglinton West subway line would have been built. The line would then traverse the city, connecting with Line 1 Yonge–University, Line 2 Bloor–Danforth, and Line 3 Scarborough. There were 43 stops planned for the Eglinton Crosstown LRT, 13 of which would be underground. Surface stops would be spaced on average 500 metres (550 yd) apart and the underground stations would be 850 m (930 yd) apart on average, as constructing numerous underground stops would be costly. The average speed would be 28 kilometres per hour (17 mph), compared with the existing bus routes along Eglinton that have an average speed of 16 to 18 km/h (9.9 to 11.2 mph). The line would terminate at Kennedy station to the east in Scarborough where it would meet Line 2 Bloor–Danforth, the proposed Scarborough Malvern LRT and the Stouffville GO train line. The expected cost was CA$4.6 billion. As a result of provincial funding cuts, construction of the line was divided into two phases: Phase One would end at Jane Street, and Phase Two would terminate as had been planned at Pearson Airport. Miller's successor, Rob Ford, announced the cancellation of Transit City on December 1, 2010, the day he took office. He proposed an alternative titled the "Eglinton–Scarborough Crosstown line", which put the 19-kilometre (12 mi) line along Eglinton Avenue completely underground. The line would then follow the route of Line 3 Scarborough, thus forming a single line continuously from Black Creek Drive to McCowan. The cost would almost double to $8.2 billion and, compared to the original plan, 18 fewer stops were planned, including the elimination of the connection to Pearson Airport. Most of the additional cost would have come from putting 12 additional stations underground and for converting the Scarborough RT. On February 8, 2012, in a special meeting, Toronto City Council, led by Karen Stintz, voted 25–18 to override Mayor Ford's modifications to the project. The vote reinstated the original proposal to only construct the portion between Laird Drive and Keele Street underground while the remainder of the line is built along the surface. On November 30, 2012, the environmental assessment was revised, such that the east tunnel portal location would be moved from east of Brentcliffe to east of Don Mills; however, this was reversed in May 2013 after receiving community feedback. 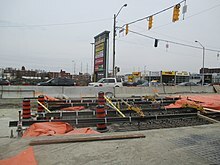 In January 2013, Toronto City Councillors from Scarborough put forward an alternative plan to proceed with the construction of the Eglinton Avenue portion of the line as planned, but to exclude the Scarborough RT from the line. In July 2013, plans for an "Eglinton-Scarborough Crosstown" line were abandoned, thereby reverting the entire line back to the plan that had been conceived under Transit City. Under Mayor John Tory, Toronto city council approved two extensions for Line 5 Eglinton, to the east and to the west, on March 31, 2016. These extensions may be subject to further optimization such as additional grade separations and fewer stops. In a later phase, Metrolinx had planned for the Eglinton Crosstown to be extended westward from Mount Dennis along Eglinton Avenue West to Toronto Pearson International Airport. However, during the 2014 Toronto mayoral election, John Tory proposed SmartTrack, which would have included a heavy rail transit line established along this section of Eglinton Avenue. In 2016, the City of Toronto released a feasibility report that found this proposal would have significant capital costs ranging from $3.6 billion to $7.7 billion. In comparison, extending the Eglinton Crosstown as approved would cost $1.3 billion. It was also found that a light rail transit line had higher ridership than a heavy rail line. The City of Toronto's Chief Planner recommended the extension of the Eglinton Crosstown line (referred to as Crosstown West) to Pearson Airport in lieu of establishing SmartTrack on Eglinton Avenue, based upon negative community impacts, higher costs, and lower projected ridership associated with a heavy rail corridor. On January 19, 2016, Tory agreed with the analysis and supported Metrolinx's original plan of extending the Crosstown. Tory has included the Crosstown West as a light-rail component of his SmartTrack plan. The estimated completion is 2023 as of July 2016. The estimated cost to build the Eglinton West LRT is $2.47 billion of which the City of Toronto contributes $1.18 billion, the federal government contributes $822.9 million, and the City of Mississauga and the Greater Toronto Airports Authority would be asked to contribute $470 million for the portion of the line in Mississauga. Approvals for the financing were still to be secured as of November 2, 2016. Public meetings for the extension, renamed the Eglinton West LRT, began November 13, 2017. The 2010 Environmental Assessment for Transit City originally planned an entirely at-grade light rail line running west from Weston Road and Mount Dennis station. However, by October 2017, the City was considering grade separation using fly-overs and fly-unders at six intersections: Martin Grove Road, Kipling Avenue, Islington Avenue, Royal York Road, Scarlett Road, and Jane Street with surface running between stations. On November 21, 2017, City staff recommended just 10 stops along Eglinton West between Mount Dennis station and Renforth station on the Mississauga Transitway. The most recent recommendation drops the stops at Rangoon, East Mall, and Russell / Eden Valley. At a City executive committee meeting on November 28, 2017, City staff recommended building the extension without any grade separation. City staff had concluded that a fully at-grade extension would provide better access for transit users and have fewer environmental impacts. Grade separation would have little improvement on traffic because the at-grade option would use signal coordination; however, grade separation would require fewer restrictions on left turns. There would be no difference in development potential with either option. However, because of feedback from the public and local politicians, Mayor John Tory recommended more study on grade separation. A fully at-grade extension is estimated to cost $1.5 to $2.1 billion. Grade separation would add an extra $881.9 million to $1.32 billion to that cost. To complement the planned extension of Line 2 Bloor–Danforth to Scarborough Town Centre, the City of Toronto drafted a plan to extend Line 5 Eglinton further east into Scarborough to terminate at the University of Toronto Scarborough campus. The 12-kilometre (7.5 mi) extension would connect with Eglinton GO Station and Guildwood GO Station and pass through "neighbourhood improvement areas" (often low-income areas) such as Eglinton East, Scarborough Junction, Morningside, Scarborough Village and West Hill. The extension would add 18 new stops east of Kennedy station and serve an estimated 43,400 additional riders per day (a ridership similar to that of Line 4 Sheppard subway). The extension follows the alignment of the Scarborough Malvern LRT, which was proposed as part of Transit City. In 2010, the Scarborough Malvern LRT was cancelled by then-Mayor Rob Ford, despite being approved by Toronto City Council and the Government of Ontario in 2009. In early 2016, the plan for the Scarborough Malvern LRT was revived and rebranded as "Crosstown East" before being renamed again to "Eglinton East" in 2017. As of November 2017[update], the project is mostly unfunded with the cost estimated at $1.6 billion to $1.7 billion, with an estimated completion date of 2023. At a November 2017 public meeting, city staff presented the possibility of extending the Eglinton East LRT by six stops to Malvern Town Centre. The Malvern extension would be 4.2 to 4.7 kilometres (2.6 to 2.9 mi) long. The extension to Malvern Town Centre would have seven stops: at Pan Am Drive, Sheppard/Morningside, Benyon Way, Murison Boulevard, Sheppard/Neilson, Wickson Trail, and Malvern Town Centre. On July 28, 2010, Metrolinx ordered four tunnel boring machines (TBMs) from Caterpillar at a cost of $54 million. Each TBM is 10 metres (33 ft) long, 6.5 metres (21 ft) in diameter and weighs 400 tonnes (390 long tons; 440 short tons). They bore 10 metres (33 ft) per day, 16 to 20 metres (52 to 66 ft) below the surface. The TBMs were named Dennis, Lea, Humber, and Don. The names were chosen by Jason Paris, a moderator of the UrbanToronto blog and forums. Dennis is named after Mount Dennis, Lea is named after Leaside, Humber is named after the Humber River, and Don is named after the Don River. The names Dennis and Lea combined allude to the poet Dennis Lee. By the time all four machines reach Yonge Street, enough dirt will have been removed to fill the Air Canada Centre (renamed Scotiabank Arena in 2018) to the height of the CN Tower. In October 2011, the first part of tunnel construction began with the construction of a launch shaft for tunnel boring machines at Black Creek Drive. On November 9, 2011, in Keelesdale Park, Mayor Rob Ford and then-Premier Dalton McGuinty officially broke ground on the new project. In May 2012, TTC staff released a report saying that completion of the Eglinton Crosstown was unlikely by 2020 and that a more realistic in-service date would be 2022–2023. The main reason given was that the project management had been transferred from the TTC to Infrastructure Ontario which uses the Alternative Finance and Procurement strategy. That strategy would use a private contractor to complete the project, effectively requiring that contractor to redo all design work already completed by the TTC. The TTC also warned that Metrolinx's aggressive timeline would lead to severe construction-related disruptions to communities and traffic because large stretches of the Eglinton Avenue would have to be torn up concurrently to meet deadlines. In January 2013, Infrastructure Ontario issued a request for qualifications to shortlist companies to construct the line. A request for proposal was expected in the summer of 2013. On February 22, 2013, TBMs Don and Lea arrived in Keelesdale Park. In June 2013, the TBMs Don and Lea began tunnelling on the line. Traffic on Eglinton Avenue near Keele Street was reduced to one lane in each direction. On November 12, 2013, Metrolinx awarded a contract to construct the eastern portion of the Crosstown to a joint venture between Aecon Group Inc. and ACS Dragados Canada Inc. to construct the eastern portion of the line between Yonge Street and Laird Drive. In March 2014, work began to clear utilities and trees on the south side of Eglinton Avenue just east of Brentcliffe Road in order to set up the eastern launch shaft. For two and a half years, traffic around the excavation site will be reduced from two to one lane in each direction. West of the site, more lane restrictions will go into effect to construct head walls (below-ground walls that form the ends of each subway station) at the future Laird, Bayview and Mt. Pleasant stations. There will also be lane restrictions for two years near Hanna Road to build an emergency exit near Leaside High School. By April 2014, the TBMs had arrived at Caledonia station. In April 2014, The Globe and Mail reported that the two western tunnel boring machines were excavating "approximately 1,000 cubic yards of spoil", per day. For the year prior to May 2014, the two TBMs Dennis and Lea had been excavating and installing concrete tunnel liners at a rate of approximately 10 metres (33 ft) per day. The tunnels are lined with precast concrete liner segments. Six 2.5-tonne (2.8-ton) segments form each ring. In early December 2014, Dennis and Lea arrived at Eglinton West station. Dennis stopped to allow Lea to catch up, so that they would arrive at Eglinton West station at the same time. On the weekend of April 18–19, 2015, the boring machines, Dennis and Lea, were lifted out of a shaft west of Allen Road and moved about 100 metres (330 ft) to a shaft just east of Allen Road. In April 2015, merchants along Eglinton Avenue West were complaining of lost revenue (up to a 35% dip in sales), because construction was discouraging customers with snarled traffic, limited parking options, reduced foot traffic and dusty sidewalks. By September 2015, the TBMs Don and Humber arrived for assembly in the shaft at Brentcliffe Road before starting to drill the 3.25-kilometre (2.02 mi) section west to Yonge Street. On September 24, 2015, Transportation Minister Steven Del Duca issued a statement saying the Crosstown would not operate until September 2021, in order "to mitigate disruption to the local community and infrastructure as much as possible." The earlier plan had been to open in 2020 with tunnelling and station construction to start in 2012. Infrastructure Ontario has awarded the Crosstown construction contract to Crosslinx, a consortium led by SNC Lavalin. It will take about four years to build the stations, 15 of which will be underground. On September 29, 2015, TBM Don started to bore the north tunnel from the Brentcliffe Road launching site westward towards Yonge Street. TBM Humber will start boring the south tunnel approximately one month later. On November 3, 2015, Del Duca announced that the contract awarded to Crosslinx Transit Solutions to complete the Crosstown and maintain it for 30 years will cost $2 billion less than originally estimated. Future site of Forest Hill station; the House of Chan façade unintentionally collapsed, injuring several passersby. On March 10, 2016, a ground-breaking ceremony was held at the site of Keelesdale station, the first station to be started for construction along the Eglinton Crosstown line. In February 2016, work began on the extraction shaft for TBMs Humber and Don, which are digging the eastern segment of the line. However, the hole in the street there will be much smaller than the one near Leslie Street. On April 18, 2016, at the location of the future Forest Hill station, the façade of the former House of Chan restaurant and the scaffolding that was holding it up collapsed, injuring seven people. On May 10, TBMs Dennis and Lea, which had been boring the western segment of the line, completed their work by reaching Yonge Street. Dennis and Lea bored 6.4 kilometres (4.0 mi), installing 25,647 precast concrete tunnel segments to construct the 4,279 rings to line the twin tunnels. On August 17, TBMs Don and Humber, which had been boring the eastern segment of the line, completed their work by reaching Yonge Street. Don and Humber bored 3.3 kilometres (2.1 mi), installing 26,178 precast concrete tunnel segments to construct the 4,363 rings to line the twin tunnels. On September 1, Bombardier Transportation, which is producing cars for the line, failed to meet the delivery deadline for the pilot vehicle. As a result, Metrolinx filed notice to terminate the contract with Bombardier. On November 3, 2016, Metrolinx file a "notice of intention" to cancel its contract with Bombardier for the Crosstown's rolling stock. On February 10, 2017, Bombardier filed an injunction, seeking to compel Metrolinx to stick with their contract. Metrolinx responded that Bombardier did deliver a prototype for testing, as required by the contract. However, Metrolinx claimed that the prototype was so incomplete that it would not power up. Between March 13 and 17, the TBMs Don and Humber were removed in pieces from the extraction shaft on Eglinton Avenue just east of Yonge Street. In July 2017, construction crews began preparation for constructing the eastern at-grade portion of the line by removing the median in the roadway. On August 9, the first piece of track, a turnout, was installed at the Eglinton Maintenance and Storage Facility in Mount Dennis. The facility was scheduled for completion in late 2018, but construction is now expected to be complete in early 2019. In July 2018, Crosslinx, the construction company building the LRT line, sued Metrolinx, claiming that utility work prior to construction exceeded timelines Metrolinx had specified. Crosslinx sought to extend the 2021 deadline for the opening of the transit line by one year. In August 2018, Metrolinx submitted a filing with the Ontario Superior Court of Justice to dismiss the lawsuit. This was based on an agreement with Crosslinx to resolve disputes only after construction has been completed. The lawsuit was settled by Metrolinx in September 2018 under undisclosed terms. It was revealed by the Auditor General of Ontario that one of the terms included an additional $237 million to be paid to Crosslinx for an assurance to meet Metrolinx's 2021 deadline. In October 2018, the Eglinton Maintenance and Storage Facility was substantially complete. By December 2018, 10 kilometres (6.2 mi) of track had been installed. The line requires 47 kilometres (29 mi) of track in total. On January 8, 2019, Bombardier delivered the first Flexity Freedom vehicle to the Eglinton Maintenance and Storage Facility, which, according to Metrolinx, was "substantially complete and ready to receive the vehicles" by this date. In January 2019, the first concrete pour for the surface section occurred at the location of the future O'Connor stop at Eglinton Square. Before being encased in concrete, conduit pipes were laid to support communications and power cables for the Crosstown's stations and stops. From early July to late August 2019, Leslie Street at Eglinton Avenue is expected to be closed for the installation tracks and infrastructure at the intersection. During this time, the TTC 51 Leslie bus will be turning back at Leslie and Eglinton at a temporary bus loop. The temporary closure would allow work to be completed in one section instead of two, thus eliminating joints in the road and track. This would provide a higher quality result reducing future maintenance. The closure would also reduce the construction period at the intersection from six months to two. Metrolinx expects the line to be completed by September. Crosslinx Transit Solutions, a consortium of more than 26 companies, was awarded the contract to design, build and finance the Eglinton Crosstown line and to maintain it for 30 years. The contract, which excludes boring the tunnels, is for completing all other remaining work, including the stations and the finishing work within the tunnels. Some of the members of the consortium are SNC-Lavalin, Aecon, EllisDon, ACS Infrastructure Canada, Dragados, IBI Group and the Bank of Nova Scotia. The contract defines a public–private partnership. The 30-year contract to build and maintain the line will total $9.1 billion. Capital costs will be $5.3 billion, with each of the 15 underground stations costing $80–$100 million to build and the ten street-level stops $3–$5 million each. The remainder will be for financing, lifecycle and maintenance costs. In the planning stages for Line 5 Eglinton, many stations and stops were given working names identical to names of pre-existing stations within the Toronto subway system. On November 23, 2015, a report to the TTC Board recommended giving a unique name to each station within the subway system (including Line 5 Eglinton). Thus, several stations with non-unique working names were renamed, even those which will be comparatively simple on-street surface stops (new name in brackets): Keele (Keelesdale), Dufferin (Fairbank), Bathurst (Forest Hill), Bayview (Leaside), Leslie (Sunnybrook Park), Don Mills (Science Centre), Victoria Park (O'Connor) and Warden (Golden Mile). Despite its unique name, Eglinton West station will be renamed to Cedarvale to avoid confusion with Eglinton station. Because Line 5 will be owned by the province of Ontario and not the TTC, the rolling stock, Bombardier's Flexity Freedom light rail vehicles, will use standard gauge, not the TTC's own slightly larger gauge. Like the Flexity Outlook vehicles Bombardier is building for the TTC's streetcar system, initial work building the chassis was performed at Bombardier's Mexican plant in Ciudad Sahagún, Hidalgo, with final assembly at Bombardier's plant in Thunder Bay. As with the Flexity Outlook vehicles produced in Mexico, workers in Thunder Bay claimed the Mexican-built chassis were not built with enough precision, and that they had to be rebuilt once they arrived in Canada. Consequently, Bombardier's delivery of the vehicles was years late. On October 30, 2018, Bombardier announced that the first Flexity Freedom vehicle had completed its in-house testing and would be delivered for on-site testing in Toronto in November 2018. However, the first vehicle arrived late on January 8, 2019. The contract requires five more vehicles to be delivered by February 2019 with the balance of the order to be delivered in time for the route's opening. Line 5 Eglinton will run underground for 10 km (6.2 mi) from Mount Dennis to just east of Brentcliffe Road before rising to the surface to continue another 9 km (5.6 mi) to end at Kennedy station. A short portion of the line across the Black Creek valley will be elevated, between Mount Dennis and Keelesdale stations. Parts of the surface route will use "green track", that is, track with vegetation growing beside and between the rails. Green track will be used between the Brentcliffe Road tunnel portal (western end of the surface route) and Birchmont Road (Birchmount stop in Scarborough) with paved gaps at intersections, surface stops and the underground Science Centre station. Keelesdale Underground Originally called Keele. Fairbank Underground Originally called Dufferin. Yonge–University at the current Eglinton West station. The station is slated to be renamed Cedarvale when Line 5 opens. Forest Hill Underground Originally called Bathurst. Avenue Underground Oriole Park was once considered, but then rejected, as the station name. Leaside Underground Originally called Bayview. Laird Underground Easternmost station of the underground central section. Sunnybrook Park On-street Westernmost of the at grade stops. Side platforms east of Leslie Street. Originally called Leslie. Science Centre Underground Originally called Don Mills. Only underground station not within the central underground section. Aga Khan Park On-street Side platforms west of Don Valley Parkway. Originally called Ferrand. Wynford On-street Side platforms on opposite sides of a new pedestrian crosswalk, which will cross Eglinton west of the bridge over Wynford Drive. GO Transit's Richmond Hill line crosses under Eglinton a short distance to the east, but no contingency has been made for a connection. Sloane On-street Centre platform east of Bermondsey Road/Sloane Avenue. Originally called Bermondsey. O'Connor On-street Side platforms east from Victoria Park Avenue to O'Connor Drive. Originally called Victoria Park. Pharmacy On-street Side platforms east of Pharmacy Avenue. Hakimi Lebovic On-street Side platforms on opposite sides of Lebovic Avenue/Hakimi Avenue. Originally called Lebovic. Golden Mile On-street Side platforms on opposite sides of Warden Avenue. Originally called Warden. Birchmount On-street Side platforms east of Birchmount Road. Ionview On-street Side platforms west of Ionview Road. As part of the Crosstown project, six stations along Line 5 Eglinton will feature eight artworks. The six stations to have a major artwork will be (from west to east) Mount Dennis, Caledonia, Cedarvale (Eglinton West), Eglinton, Science Centre and Kennedy. These six stations were chosen because they are all interchange stations having higher passenger volumes. All artworks will be integrated into station design and construction rather than being stand-alone pieces. Because of the controversy over the artwork LightSpell at Pioneer Village station, in which commuters can display messages that can violate the 2009 revision of TTC's By-Law No. 1, none of the Line 5 artworks will be interactive. The art budget is about $10 million. About $1 million of that budget will be used for digital art to appear on screens at stations along the line. Usage of automatic train control on the underground section of Line 5 Eglinton. On the surface, usage of dedicated right-of-way transit lanes separate from regular traffic and usage of priority signalling at intersections to ensure certainty in travel times. Light rail vehicles and subways can both travel as fast as 80 kilometres per hour (50 mph). However, actual speed is determined by the spacing of the stops and the dwell times at stops. Line 5 vehicles will have an average speed of 28 kilometres per hour (17 mph). As a comparison, the average speed of the subway Line 2 Bloor–Danforth is 32 kilometres per hour (20 mph). The projected ridership of the line is 5,400 passengers per hour in the peak direction by 2031, but the capacity of the vehicles is 15,000 passengers per hour per direction. The surface section of the line will run on a proof-of-payment system but the underground stations will have regular fare gates and staff; Presto cards will be available for use across the entire line. Metrolinx requires 76 Flexity Freedom LRVs to operate the line. After feeling unsure if the Bombardier vehicle order could be relied upon for timely delivery, Metrolinx made a contingency order with Alstom for 61 Citadis Spirit vehicles, of which 44 would be for Line 5 and the remaining 17 for Line 6 Finch West. Should the Flexity order arrive after all, surplus Alstom vehicles will be used on other Metrolinx projects (most likely the Hurontario LRT in Peel Region). Annual operating and maintenance costs are estimated to be $80 million upon opening of the line. However, fare revenue and the costs saved by eliminating Eglinton bus service would result in a net annual cost of $39 million. There will a total of 12 turnbacks along the line to reverse LRT trains—seven at underground stations and five on the surface section. Avenue Station and Laird Station will be turnback stations that also have a storage track that trains can enter and exit in either direction. The storage tracks will accommodate a train in case of an emergency or change in service as well as allowing for a change of direction. A maintenance and storage facility is required for Line 5, given the new technology employed and the number of vehicles ordered. The Eglinton maintenance and storage facility will have storage for 162 Flexity Freedom LRT vehicles and have extensive maintenance facilities to keep them running smoothly. The facility will be built near the line's western terminus at Mount Dennis station on lands formerly occupied by Kodak's Toronto campus. ^ a b c d Kalinowski, Tess (September 24, 2015). "Eglinton Crosstown to open a year later than expected". Toronto Star. Retrieved September 24, 2015. ^ Consiglio, Alex (October 3, 2012). "TTC to operate city's new LRT lines". Toronto Star. Retrieved November 1, 2012. ^ Spurr, Ben (May 12, 2017). "Province had no choice but to seek Bombardier substitute for Eglinton LRT: Del Duca". Toronto Star. Retrieved May 12, 2017. ^ a b "Eglinton LRT 2012 update" (PDF). Metrolinx. February 2012. Retrieved November 1, 2013. ^ "Eglinton-Scarborough Crosstown Update" (pdf). Metrolinx. June 23, 2011. ^ "Eglinton Crosstown Light Rail Transit stops and stations" (PDF). City of Toronto. November 2010. Retrieved July 30, 2011. ^ a b c d "Eglinton Crosstown Backgrounder". Metrolinx. Retrieved November 8, 2013. ^ Spears, John (August 9, 2008). "Distance between LRT stops criticized". Toronto Star. Retrieved August 14, 2008. ^ "Eglinton Transit City line may survive". CBC News. January 4, 2011. Retrieved April 24, 2011. ^ a b Kalinowski, Tess; Dale, Daniel (February 9, 2012). "Special transit meeting: Mayor Rob Ford dismisses council's vote against his subway plan". Toronto Star. Toronto. Archived from the original on September 9, 2012. ^ Kalinowski, Tess (May 12, 2013). "Metrolinx puts Leslie back on the Crosstown map". Toronto Star. Retrieved November 8, 2013. ^ Kalinowski, Tess (May 6, 2013). "Scarborough councillors seek subway line instead of LRT: A group of Toronto councillors wants to replace the planned LRT for Scarborough with a subway. But a subway would cost $500 million more". Toronto Star. Archived from the original on July 3, 2013. Retrieved July 3, 2013. An LRT would use the same route as the SRT. It would be 9.9 kilometres (6.2 mi) versus 7.6 kilometres (4.7 mi) of subway. The LRT would have seven stations, the subway, only three. ^ Kalinowski, Tess (January 17, 2013). "TTC report threatens to reopen Scarborough subway debate: One commissioner says it's proof Scarborough can have a new subway line under construction within the decade, but Metrolinx dismisses that". Toronto Star. Archived from the original on July 3, 2013. Retrieved July 3, 2013. Glenn DeBaeremaeker (Ward 38, Scarborough Centre) said the latest TTC report gives him new confidence that there will be a subway underway in Scarborough within a decade. ^ a b c Keesmaat, Jennifer (January 18, 2016). "SmartTrack Western Corridor Feasibility Review" (pdf). City of Toronto. Retrieved February 12, 2017. The feasibility review examined heavy rail corridor options from several perspectives: technical requirements for heavy rail, service concept and integration with RER, regulatory requirements for heavy rail, land use compatibility and impacts, and cost. ^ Munro, Steve (September 16, 2014). "John Tory's "SmartTrack": Will That Train Ever Leave The Station?". Steve Munro. ^ Munro, Steve (October 17, 2014). "SmartTrack: That Pesky Curve in Mount Dennis". Steve Munro. ^ "SmartTrack still on track despite changing plan, Mayor Tory says". Toronto Star. January 19, 2016. ^ a b Moore, Oliver (July 13, 2016). "Toronto City Council approves planning for raft of transit projects". The Globe and Mail. Retrieved July 14, 2016. ^ Spurr, Ben; Pagliaro, Jennifer (June 26, 2016). "Mayor John Tory's transit priorities face financial, political challenge: analysis". Toronto Star. Retrieved July 20, 2016. ^ Grewal, San (November 2, 2016). "Mississauga fumes over $470 million Toronto LRT funding assumption". Toronto Star. Retrieved November 2, 2016. ^ Johnson, Andrew (November 7, 2017). "Public Meetings for Eglinton West LRT to Begin November 13th | Urban Toronto". Urban Toronto. Retrieved November 13, 2017. ^ "About the Eglinton West LRT". Eglinton West LRT. City of Toronto. Retrieved November 13, 2017. ^ Johnson, Andrew (November 7, 2017). "Public Meetings for Eglinton West LRT to Begin November 13th". UrbanToronto. Retrieved November 22, 2017. ^ "Eglinton West LRT: Stage One Report" (PDF). City of Toronto. October 3, 2017. Retrieved November 22, 2017. ^ a b c Pagliaro, Jennifer (November 28, 2017). "Tory backs second look at tunnelled Eglinton West LRT". Toronto Star. Retrieved November 29, 2017. ^ "Attachment 2 Eglinton West LRT Extension Technical & Planning Update" (PDF). City of Toronto. October 3, 2017. p. 2. Retrieved November 22, 2017. ^ Pagliaro, Jennifer (November 21, 2017). "City staff recommend moving ahead on SmartTrack stations despite financing uncertainty". Toronto Star. Retrieved November 22, 2017. A report from city staff released Tuesday ... recommends a 10-stop LRT along Eglinton Ave. West. ^ Moore, Oliver; Gee, Marcus (January 20, 2016). "Scarborough subway would shrink under plan to extend Eglinton Crosstown". The Globe and Mail. Retrieved November 30, 2017. ^ a b Pagliaro, Jennifer; Kalinowski, Tess (January 16, 2016). "New Scarborough transit plan 'buys peace in the land'". Toronto Star. Retrieved January 20, 2016. ^ Keenan, Edward (June 2, 2016). "Priority should be alternative transit routes into downtown: Keenan". Toronto Star. Retrieved June 5, 2016. ^ "Scarborough Malvern Light Rail Transit (LRT): Notice of Completion of the Environmental Project Report" (PDF). City of Toronto. October 16, 2009. Retrieved February 12, 2017. The Toronto Transit Commission (TTC) and the City of Toronto have completed an Environmental Project Report (EPR) for the fifteen kilometre Scarborough Malvern Light Rail Transit (LRT) which would connect Kennedy Subway Station with north-eastern Scarborough. ^ "Request for Approval of the Scarborough-Malvern LRT Environmental Assessment Study – City Council Decision". City Of Toronto. September 30, 2009. Retrieved February 12, 2017. City Council approve the recommendations of the Scarborough-Malvern LRT Transit Project Assessment Study and authorize submission of the Environmental Project Report (EPR) to the Ministry of the Environment. ^ "Minister's Notice to Proceed" (PDF). Ministry of Transportation of Ontario. December 15, 2009. Retrieved February 12, 2017. ^ a b c Pagliaro, Jennifer (November 29, 2017). "Mayor John Tory and Councillor Josh Matlow square off on Scarborough transit". Toronto Star. Retrieved November 30, 2017. ^ "Eglinton East Corridor Wish Mapping". Eglinton East LRT. Retrieved January 26, 2019. ^ Kalinowski, Tess (July 28, 2010). "Metrolinx orders tunneling machines". Toronto Star. ^ a b c McKenzie, Daniel (August 17, 2016). "Big dig wraps for Eglinton Crosstown LRT". Toronto Sun. Retrieved August 18, 2016. ^ "Announcing the winning names of the Tunnel Boring Machine Naming Contest..." Metrolinx. June 5, 2013. Retrieved February 12, 2017. The most popular set of names were shortlisted and voted on by the public. Thank you to Jason Paris (Dennis and Lea), Graham Gersdorff, Val Dodge and Reiner Kravis (Don and Humber) of Toronto for submitting the winning names! ^ Leal, Brandon (June 5, 2013). "Eglinton Crosstown TBMs get a Personality and a Send-Off". Urban Toronto. Retrieved February 12, 2017. In October 2012 Metrolinx announced a near month long contest public contest to name the tunnel boring machines (TBM). ^ a b c d Winsa, Patty (March 21, 2014). "Metrolinx begins its big eastern dig on the Eglinton Crosstown LRT: Get ready for traffic". Toronto Star. Archived from the original on March 23, 2014. Parts for the next two tunnel-boring machines to work on digging underground parts of the line — nicknamed Don and Humber — will arrive this summer and be assembled in the shaft, before they start drilling the 3.25-kilometre section west to Yonge St.
^ Alcoba, Natalie (November 9, 2011). "Ford, McGuinty get up-close look at Eglinton LRT construction". National Post. Retrieved August 4, 2014. ^ Chu, Showwei (May 29, 2012). "Eglinton LRT unlikely to meet 2020 completion date: TTC report". Citytv News. Toronto. Archived from the original on September 9, 2012. ^ "Request for Qualifications Issued for the Eglinton Crosstown LRT and Scarborough LRT Lines". Infrastructure Ontario. January 22, 2013. Retrieved March 10, 2013. ^ Kalinowski, Tess (February 22, 2013). "Eglinton Crosstown LRT tunneling a step closer". Toronto Star. Retrieved August 4, 2014. ^ "Machines begin tunnelling for Eglinton Crosstown LRT". CBC News. June 5, 2013. Retrieved July 5, 2013. ^ Landau, Jack (November 12, 2013). "Metrolinx Awards Contract for Crosstown LRT East Tunnel Section". Urban Toronto. Archived from the original on September 3, 2014. Retrieved October 12, 2014. As tunnel boring machines continue to etch their path eastbound underneath Eglinton Avenue from Keele Street for the western leg of the Eglinton Crosstown LRT project, a winning bidder has been announced for the eastern section of tunnel, which will run from Brentciffe Road to Yonge Street, starting just east of the easternmost underground station at Laird Drive. ^ Alamenciak, Tim (April 30, 2014). "Eglinton Crosstown LRT back on schedule, engineer says". Toronto Star. Archived from the original on August 3, 2014. Retrieved January 22, 2015. "It's a seemingly simple process that's actually very high tech," said Kramer. The first of the two tunneling machines (dubbed Dennis) entered the ground June of 2013 and has made it to Caledonia Rd. from its starting point at Black Creek Dr. The other machine, Lea, is just behind. ^ Moore, Oliver (April 29, 2014). "Underground for now, construction proceeds on Eglinton LRT". The Globe and Mail. Archived from the original on December 21, 2014. Retrieved January 22, 2015. Headwalls that will form the box of the stations have been installed at Keele Street and Caledonia Road, and work is under way on one at Dufferin Street. The TBMs go right through headwalls after they have been built, in order to ensure a tight seal, and the two at work in this area are now on either side of what will eventually be the Caledonia LRT station. ^ Gupta, Rahul (May 9, 2014). "Eglinton LRT: Construction activity well underway on both sides of Allen Road". Inside Toronto. Archived from the original on January 23, 2015. Retrieved January 22, 2015. Digging 50 feet below street level, the 81-metre long TBMs nicknamed Dennis and Lea are located in the vicinity of Caledonia Road, one of 12 underground Crosstown stations planned for the route. They are expected to reach the Allen later this year, when they will be redeployed beyond Eglinton West subway station to continue the dig east towards Yonge Street. ^ Carville, Olivia (April 19, 2015). "An exciting glimpse at boring machines on Eglinton". Toronto Star. ^ Pelley, Lauren (April 19, 2015). "Eglinton businesses feeling sting of Crosstown construction". Toronto Star. ^ "Launch of tunnel boring machines and tunnelling work in the east". Metrolinx. October 1, 2015. Retrieved October 13, 2015. ^ a b c Kalinowski, Tess (November 3, 2015). "$9.1B Crosstown LRT mega-contract comes in under estimates". Toronto Star. Retrieved November 3, 2015. ^ "Crews break ground on 1st of 25 Eglinton Crosstown stations". CBC News. March 10, 2016. Retrieved March 22, 2016. ^ "Temporary Closure of Holly Street at Eglinton Avenue East". Metrolinx. February 24, 2016. Retrieved February 12, 2017. The extraction shaft is required to be completed in advance of receiving the two TBMs (Don and Humber), which are currently tunnelling westward from their start-point, just east of Brentcliffe Road. ^ "Crosstown Tunnelling Reaches Yonge Street". Ministry of Transportation of Ontario. May 10, 2016. Retrieved February 12, 2017. 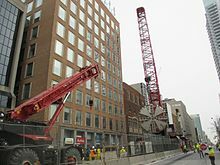 Today Tunnel Boring Machines (TBMs) Dennis and Lea, boring the western segment tunnels, arrived at Yonge Street having travelled 6,419 metres from where they started at Black Creek Drive in spring 2013. ^ a b Spurr, Ben (November 3, 2016). "Metrolinx says it intends to cancel Bombardier LRV contract". Toronto Star. Retrieved February 12, 2017. The ministry of transportation confirmed to the Star on Thursday that Metrolinx, the provincial transit agency, has issued a formal notice of intent to terminate its $770-million contract for up to 182 Bombardier LRVs. ^ a b c Jeff, Shaun (February 10, 2017). "Bombardier taking Metrolinx to court over threats to scrap light-rail vehicle deal". Toronto Sun. Retrieved February 12, 2017. Bombardier filed an injunction Friday with Ontario's Superior Court in response to what the company calls "unjustified threats" to kill a $770-million contract signed in 2010. ^ a b Spurr, Ben (February 10, 2017). "Bombardier taking Metrolinx to court". Toronto Star. Retrieved February 12, 2017. Bombardier's legal gambit comes three months after Metrolinx issued the company a notice of intention to cancel its contract for up to 182 light rail vehicles. ^ Moore, Oliver (February 14, 2017). "Metrolinx rejects Bombardier's claims of laxity in wake of court filing". The Globe and Mail. Retrieved February 15, 2017. A senior person at Bombardier familiar with the process says the company had to go to court after months of behind-the-scenes talks with Metrolinx hit an impasse. ^ "Join us March 13 to say farewell to the Crosstown's TBM". Metrolinx. October 3, 2017. Retrieved March 13, 2017. Metrolinx invites you to join us throughout the week of March 13, 2017 to watch the pieces of being lifted and transported offsite. We will start the process of extracting the tunnel boring machines (TBM) from the completed east tunnels, and say farewell to our faithful helpers, TBM Don and TBM Humber. The TBMs will be disassembled and lifted from extraction shaft just east of Yonge & Eglinton in four oversized sections over four days. ... Each piece will be lifted from the extraction shaft in the morning, and placed on the ground within the construction zone. Later, after 9 p.m. that night, the piece will be loaded onto a large truck and hauled away. TBM Don, the machine that bored the north tunnel, will be removed first. ^ Dolski, Megan (March 13, 2017). "Work starts on stations, tracks for Eglinton-Crosstown LRT". Toronto Star. Retrieved March 14, 2017. ^ a b "Eglinton Crosstown LRT Updates – July 2017". Metrolinx. July 14, 2017. Retrieved July 14, 2017. ^ a b "Eglinton Crosstown LRT Updates – August 2017". Metrolinx. August 11, 2017. Retrieved August 11, 2017. ^ Spurr, Ben. "Companies building Eglinton Crosstown LRT sue Metrolinx for breach of contract". The Star. Retrieved August 8, 2018. ^ a b "Auditor-General says Metrolinx paid massive settlement without thoroughly reviewing claim". Retrieved December 18, 2018. ^ Spurr, Ben. "Metrolinx asks court to block lawsuit over Eglinton Crosstown LRT line". The Star. Retrieved August 8, 2018. ^ "LRT legal challenge settled with terms kept confidential". The South Bayview Bulldog. September 7, 2018. Retrieved September 24, 2018. ^ "Metrolinx—LRT Construction and Infrastructure Planning" (PDF). www.auditor.on.ca. Retrieved December 18, 2018. ^ a b "Eglinton Crosstown Update". Metrolinx. January 11, 2019. Retrieved January 13, 2019. ^ a b "Bombardier delivers first LRV for Eglinton Crosstown, on track for TTC streetcar delivery". CityNews. January 8, 2019. Retrieved January 8, 2019. ^ "East Guideway Concrete Pour". Metrolinx. February 15, 2019. Retrieved April 7, 2019. ^ "Proposed Leslie Street Closure". March 29, 2019. Retrieved April 3, 2019. ^ "Eglinton Crosstown > Project > FAQs". thecrosstown.ca. Metrolinx. Retrieved March 13, 2017. ^ Moore, Oliver (November 3, 2015). "Ontario government shaves $2-billion off Eglinton Crosstown LRT price tag". The Globe and Mail. Retrieved November 3, 2015. ^ "Line 5 Eglinton Station Names" (PDF). Board Presentation. Toronto Transit Commission. November 23, 2015. Retrieved November 30, 2015. In order to reduce confusion with Eglinton Station and Line 5 Eglinton, Eglinton West Station will be renamed. ... TTC staff evaluated the initial report and the proposed names and provided feedback and recommendations. A primary TTC concern was to avoid replication and redundancy with existing TTC station names. The proposed names are unique and are not likely to be confused with existing station names. ^ a b Kalinowski, Tess (November 24, 2015). "Eglinton West station to become 'Cedarvale' because of Crosstown LRT". Toronto Star. Retrieved November 24, 2015. ^ "Eglinton Crosstown Line Station and Stop Names". Metrolinx. October 2, 2015. Retrieved October 2, 2015. ^ a b Spurr, Ben (October 30, 2018). "First Eglinton Crosstown LRT vehicle to be ready in November, Bombardier says". Toronto Star. Retrieved October 30, 2018. The company plans to ship the vehicle to Toronto next month, and has a target of delivering five more by mid-February. It intends to supply the entire fleet of 76 vehicles to Metrolinx, the provincial agency that's building the Crosstown, in time for the line's opening. ^ "City of Toronto: Get Involved > Eglinton Crosstown Light Rail Transit (LRT) > Frequently Asked Questions > Stations and Stops". City of Toronto. August 20, 2011. Archived from the original on October 21, 2011. Retrieved October 24, 2011. ^ "Science Centre Station and West At-Grade (Sunnybrook Park Stop to O'Connor Stop) Open House". Metrolinx. November 14, 2017. p. 29. Retrieved November 14, 2017. ^ "Stations and Stops". Metrolinx. Retrieved January 10, 2018. ^ "Leslie Stop". Eglinton Crosstown. Retrieved October 22, 2016. ^ "Ferrand Stop". Eglinton Crosstown. January 14, 2016. Retrieved October 22, 2016. ^ "Wynford Stop". Eglinton Crosstown. Retrieved October 22, 2016. ^ "Bermondsey Stop". Eglinton Crosstown. Retrieved October 22, 2016. ^ "Victoria Park Stop". Eglinton Crosstown. Retrieved October 22, 2016. ^ "Pharmacy Stop". Eglinton Crosstown. Retrieved October 22, 2016. ^ "Lebovic Stop". Eglinton Crosstown. Retrieved October 22, 2016. ^ "Warden Stop". Eglinton Crosstown. Retrieved October 22, 2016. ^ "Birchmount Stop". Eglinton Crosstown. Retrieved October 22, 2016. ^ "Ionview Stop". Eglinton Crosstown. Retrieved October 22, 2016. ^ a b Spurr, Ben (January 15, 2018). "Art installations will enliven Eglinton Crosstown LRT". Toronto Star. Retrieved January 18, 2018. ^ Munro, Steve. "Metrolinx Announces Design Changes and Public Meetings on Eglinton LRT (Update 8)". Steve Munro. Archived from the original on March 4, 2015. Retrieved June 17, 2013. ^ "Light Rail Transit Facts". Metrolinx. May 31, 2015. Retrieved May 31, 2015. ^ TTC/City Of Toronto (March 2010). "Eglinton Crosstown Environmental Report" (PDF). Retrieved April 8, 2019. ^ Spurr, Ben (July 20, 2016). "Metrolinx threatens legal action over late delivery of light rail vehicles". Toronto Star. Retrieved July 20, 2016. ^ "Metrolinx statement on Alstom/Bombardier". Metrolinx. Retrieved May 12, 2017. ^ Spurr, Ben (May 13, 2017). "How do TTC's streetcar options compare? It's Bombardier versus Alstom". Toronto Star. Retrieved May 13, 2017. ^ Spurr, Ben; Pagliaro, Jennifer (October 31, 2016). "Report outlines steep costs of running new Toronto transit lines". Toronto Star. Retrieved October 31, 2016. ^ Lorinc, John (November 23, 2012). "Down (but not out) Mount Dennis area pins hopes on Metrolinx". The Globe and Mail. Archived from the original on March 4, 2016. Retrieved March 28, 2013. A sprawling storage and maintenance facility for the light-rail vehicles will be built on the Kodak site within a few years. ^ Munro, Steve (February 17, 2010). "Eglinton LRT: Trouble Brewing in Mt. Dennis (Update 2)". Archived from the original on March 4, 2015. Some speakers addressed the use of the Kodak lands for the proposed carhouse, and asked that alternative schemes be considered. Part of this relates to a proposed "big box" development on the land. However, Council approved the acquisition of this property, by expropriation if necessary, in December. ^ Kalinowski, Tess (February 16, 2010). "Residents ask TTC for LRT tunnel through Mount Dennis". Toronto Star. Archived from the original on March 29, 2013. In addition to the $4.6 billion the province has committed to the Eglinton LRT, the centrepiece of Toronto's Transit City plan, the TTC also wants to build a carhouse on the old Kodak lands in Mount Dennis. Wikimedia Commons has media related to Line 5 Eglinton. Tunnelling for The Crosstown on YouTube – Video with animation published on June 29, 2012. Eglinton Crosstown Station Flyover on YouTube – Video published on May 2, 2017, showing aerial views of construction in progress along the line.